To be built Luxury Capstone Homes – town home. 2356 sq. ft. home 2-bedroom, 2.5-bath, plus a study, 2-car garage. 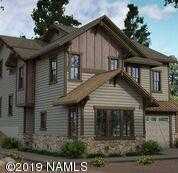 Included luxury features, Pella wood cased windows, wall oven and microwave, wood flooring, granite t/o, multifaceted ext. siding and stone accents. Flagstaff Ranch is a premier golf community at over 7200 feet in elevation. It combines golf and nature – it is common to see elk & antelope in the Caldera. Amenities: Activity & fitness center, pool, spa and tennis. An elegant 25,000 sq. ft. club house for dining. Price is for base home. Lot premiums and options may apply.